I hear it all the time, and you probably do too: ‘I want to make a difference, but I don’t know where to start.’ It’s a common refrain, and mostly the answers people get are unsatisfying. Attending a rally or writing a check to a political cause you care about may seem obvious, but those actions also can seem like single grains of sand in an hourglass. You can write an email or a letter to an elected official, or give them a call, but you’re just one person. However, there’s a way for you to have a real impact on your community that most people don’t consider, and not only will it let you take action to make a difference, but it will also help address a huge problem throughout our state and our republic. If you’re a regular voter, you’ve almost certainly seen it before: a space on your ballot to select a candidate for an office where only one name appears. In many parts of our state, and for many offices, elections go uncontested because only one candidate has filed. 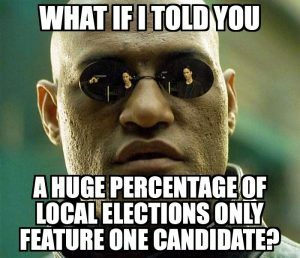 Sometimes, no candidate files at all, and you’re left with an election on your ballot with no candidates. Whether for school board, city council, township trustee, or judge, these elections have a direct impact on the lives of community members, and yet the community has only one choice, or worse yet, no choices at all. Who cares who is on the township board? Make no mistake, these offices matter. Your local and county government determine how much you and other residents will pay in property taxes, whether you own your home, or your landlord passes those tax costs on to your rent. Local and county governments and school boards determine how your tax dollars are going to be spent, how your kids will be educated, and what types of businesses will locate and grow in your community. Is it as exciting, partisan, and rancorous as national politics? NO! But there’s a pretty strong argument that these offices matter as much or more than who represents you in Congress, and frankly our politics could use less excitement, partisanship, and rancor anyway. Obviously, this isn’t true in every community, but for more than 80% of local offices, that’s basically it. File for office, ask your neighbors for their votes, and have a piece of literature you can hand to people that have questions, so they know where you stand on community issues and how to reach you. Ok, I’m thinking about it. What do I do next? Have questions? Send us an email! We love it when people get involved in politics! While Grassroots Midwest typically doesn’t get involved in running local races, we will gladly share a couple of pointers by email. We’ll point you to the right info to help you decide if serving your community as an elected official might be right for you. If you think it is, we sell low cost, customized starter kits that will let you put together your own local campaign in a matter of a few hours. The word republic comes from the Latin res publica: the public business. The ancient Romans believed that participation in res publica was what made a person fully human. Whether it’s as a candidate for local office, a voter, or an activist, our republic works best when YOU participate. About the author: Adrian Hemond is CEO and Co-Founder of Grassroots Midwest, Michigan’s only bipartisan advocacy firm.